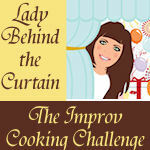 I am SO excited to be participating in the first Improv Cooking Challenge hosted by Lady Behind the Curtain! I love the whole idea of it! Cooking is one of my hobbies (obviously) and I am all about a challenge! The challenge is to take the assigned ingredients and come up with a recipe involving them in some way. This month’s challenge ingredients, caramel and apples. Caramel and Apples…Two of my favorite flavors! The possibilities are endless when it comes to these two ingredients. When assigned these ingredients for this months challenge, my brain was seriously in heaven coming up with ideas of what to do. I envisioned numerous mouth watering recipes. I called my mom (The chef I aspire to be) and ran by a few of my ideas by her. Her mind started racking with ideas and together we came up with these delicious Apple Cinnamon Rolls with Caramel Frosting. Be prepared for a delicious gourmet cinnamon roll! And to put it lightly, this frosting is DELICIOUS! Mix milk, oil and sugar in a sauce pan. Scald to 150 degrees. Let cool until mixture is lukewarm (about 30-45 minutes). Sprinkle in the yeast and let sit. After the yeast sits and activates, add in 4 cups flour. Stir the mixture together. Next stir in finely chopped apples. Cover and let sit for one hour. While dough is rising, make the filling. Peel and dice up all the apples. Apple dices should be very small, not too chunky. I like mine about a pinky nail in size. Put in a large bowl. Add lemon juice, orange juice, sugar and stir together. Add cinnamon, cloves, nutmeg, salt and flour and stir together. Next, add the butter pieces gradually and evenly dispersed or they will all clump together. The mixture should taste sweet. If it is not sweet enough, add more sugar until it gets to the flavor you desire. Also the consistency is important. You don’t want it too runny or too thick. Add flour to get it to that consistency if needed. You want it similar to the consistency of thick waffle batter, but with chucks of apple. After dough has risen and sat covered for an hour, Add in remaining 1/2 cup flour, baking powder, baking soda, and salt to the dough. Stir or knead mixture together. Divide the dough in half. Sprinkle surface with flour and roll dough out to form a thin rectangle. Spread some softened butter over dough to cover. Next, spread some of the filling over to cover the surface of rolled out dough. You can sprinkly a little more cinnamon and sugar over the filling at this point if you want a little more “cinnamon” flavor. Sprinkle some of the chopped pecans across filling about (1/3 cup). Repeat this process with the other half of the dough. let the rolls rise for 20 to 30 minutes, then bake at 375 degrees or until light golden brown, about 15 to 20 minutes or until they appear to be done. In a sauce pan over medium heat, melt butter. Add in heavy cream and brown sugar and stir mixture until it begins to boil. Remove from heat and add in 1 cup powdered sugar. Cool slightly and add in vanilla and remaining 1 cup of powdered sugar. Add in more milk if needed to thin frosting or more powdered sugar to get it thicker (I like mine thicker)Pour into a large plastic bag, cutting off on of the ends. Drizzle over apple cinnamon rolls. Top with chopped pecans and prepare to dive into a mouthful of goodness! What a GREAT recipe!!! Thanks so much for participating in THE IMPROV COOKING CHALLENGE! I can't wait to see what you make next month using Pumpkin and Cream Cheese. Could these be any more tempting? YUM! I am #30 in the Improv, having a great time hopping around! My goodness those look off the charts wonderful! If you haven't already, I'd love for you to check out my Improv Cooking Challenge recipe: Caramel Stuffed Apple Cider Cookies. Just pinned this recipe! It was fun being part of the ICC with you! My husband LOVES cinnamon rolls. I will have to share this one with him. I would absolutely pick up my plate and lick it off. That is a wonderful looking roll! These look absolutely to die for! My husband would love them! It's been fun checking out everybody's caramel apple treats! I'm #22 on the list. heavenly! i could dive right in now! Holy smokes that looks amazing! Wow, these look yummy-licious! Thanks for sharing the recipe. Can't wait to try it. Mhmm I love cinnamon rolls. Yours look great! I participated in the Improv Cooking Challenge too and I made a Peanut Butter Caramel Apple Dip. Oh.My.Goodness. 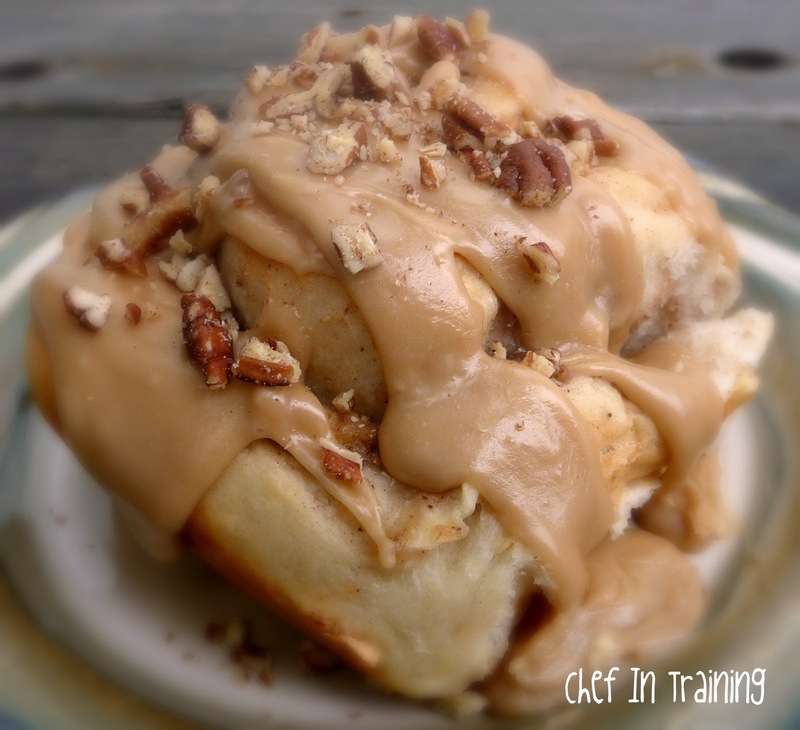 I have eaten apple cinnamon rolls a LONG time ago, but the caramel icing on yours puts it over the top! Great recipe! I need these NOW! Seriously they look amazing! I am definitely making them ASAP!! Oh my heck! I'm speechless! The caramel icing dripping off the roll looks awesome. Yum! Delicious, cinnamon rolls is always favorite of my. this dish look great! I participated in the Improv Cooking Challenge too and I made a Peanut Butter Caramel Apple Dip. Oh my goodness, those sound AMAZING! They would make a great Thanksgiving breakfast! ...Featuring you tomorrow my love! Thank you for sharing your awesomeness! Oh my, these seriously have to be the best twist on cinniman rolls I have ever seen. I cant wait to try these. Could you just open up a bakery please? ok, so i was looking at these thinking they would be good, but wasn't going to try because i am a huge fan of pioneer woman rolls- the best in the world-.... and then..... i read you used her dough recipe, i am sold!!! will have to make them! found you on pintrest:)! Your style of writing is excellent, you have a original voice.